With a sudden spike in the number of dengue cases, especially in Punjab and Delhi, it is but imperative to understand dengue symptoms for each one of us. Sudden fever with severe headaches, joint and muscle pain, and fatigue are the most common signs, which are typical of viral fever. Unmindful of the fact that it could be dengue, we mistake it for common cold, flu, viral infection, exhaustion, or body fatigue. In such conditions, we tend to use non-steroidal anti-inflammatory drugs (NSAIDs), including voveran, disprin, aspirin, brufen, and ibrufen, and paracetamol-based drugs (which include combiflam, Dolo). Please do not use these drugs on your own without medical advice, as these actually increase the risk of death from dengue. These over-the-counter drugs reduce platelet levels considerably and cause gastric or intestinal tract bleeding that decreases blood platelets, further enhancing the dengue effect. Please increase your fluid intake and keep yourself hydrated as a precautionary measure. Since dengue seems to be spreading like wildfire, it's good to learn from the experience of someone who has had experienced it herself. Anna and her son suffered from a dengue attack last year. 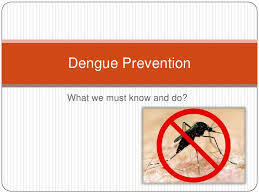 She has shared plenty of good information with us all - I am copying her messages so that you can read and see what all precautions, therapies, and steps can help overcome the dengue symptoms. OF COURSE, PLEASE CONSULT YOUR PHYSICIAN AS SOON AS YOU SEE ANY SYMPTOMS. Anna: "My son got it first....both our symptoms were exactly the same. First comes the fever which rises to 105 degrees or more and stays put fr abot 5 days..meaning wen u take paracetamol it will come down to 101 or 102 and then rise back to 104 or 105. We were having lots of pomegranate juice, wheat grass juice, apple juice...fresh at home as all these help in stabilizing the platelets which went down drastically. My sons at 1.25 and mine to 95000. "Papaya leaves are very effective. U hv to boil the leaves strain and hv that water.We did that too. And we didn't go to any hospital, nor had any allopathic medicine. No self medication plese, except paracetamol/crocin. Its important to completely rest even after the fever comes down because dengue is likely to relapse if we are not alert and the second time around is supposedly worse because it attacks our bones. Wheat grass is also an effective remedy - grind in a juicer and apply. Severe headache behind your eyes and temples plus rash over your body...reddish..pinkish in color after abt 3 or 4 days....this rash is the major diff between viral and dengue...rest physical symptoms are almost same. Take adequate steps to bring down the fever - keep applying cold water packs on both forehead and feet...to bring the stubborn fever down. After 5 days the fever suddenly breaks down and leaves u in a sweat....that's the indication that u are on yr way back....but totally exhausted and drained. PRECAUTIONS: Wear thin full sleeves..esp kids should be protected as they are less aware. Keep taking pomegranate juice,wheat grass ,giloy ,omega,beetroot, and tulsi leaves." Dengue is a back-breaking condition in which you experience the worst pain symptoms when your muscles and joints ache like anything. My brother had it last year, and we were there with him. Right from day one, we followed a multipronged approach. My brother recovered within 7 days. Ideally it takes people a month to recover from dengue symptoms. gave two homoepathic medicines for dengue - Eupatorium and rhus toxicodendron 200 ch --- 3-4 drops in water every 2 hours. I must tell you that this is a highly effective remedy for dengue. 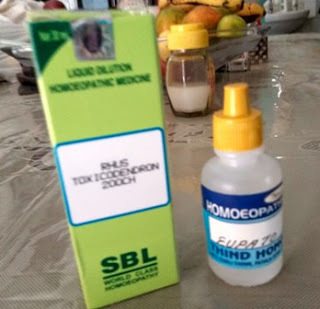 These two homoe medicines are useful in dengue fever and muscle/joint aches. This is the only dengue joint pain remedy that works effectively. Also termed "bone set", Homeopathic medicine Eupatorium Perfoliatum brings about quickest relief from severe bone and joint pains in dengue. Eupatorium Perfoliatum also provides relief from severe pain in the eye sockets, headache, and body ache. Unfortunately, being immune to one dengue strain does not make us safe from the other three. Sadly, dengue upsurge begins in the monsoon season, primarily in the north of the country. Sadly, small children are most vulnerable to dengue, since they are not able to explain their symptoms. The worst part is the symptoms are almost identical to viral fever.